Som Murmu, a 60 year old Santal cultivator and master craftsman from Birbhum, has been a wood carver for over forty years. In his youth, he tried his hand working with various media including straw, bamboo, clay tiles, asbestos and tin, as well as a short spell as a furniture maker, but found it difficult to sustain himself. He then started experimenting with musical instruments - the banam in particular and found that there was a demand for his work at local melas (fairs). The banams that were made till then were the traditional Dhodro banams, but Som started making stylized, ornate banams, more like statuettes which could also be played. His inspiration was the human body. He found that customers were more inclined to the ornate banam and he also began supplying a local handicraft shop. His gifted friend, the late Bazar Hembrom too was similarly inspired and thus began a friendly competition between the two friends, with each trying to outdo the other in designing imaginative banams. They would however get to see each others banams only at a display in the melas. Som was married off at a very young age. 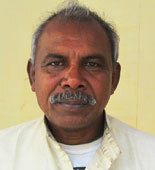 His in-laws lived in the nearby village of Parui. It was there that he met his bride`s grandfather, Tashok Hansda who used to make chadar badni puppets and roam the villages with his puppets. With his limited tools, Tashok would carve crude puppets while Som watched in awe. Constantly pestering him with questions, Som learnt that the puppets would be used for performances at Sohrai, Baha, Dasain festivals and so on. Usually there would be about 12-14 puppets, never 10. (This is because Santals believe that 10 is not an auspicious number : Dawshey dosh). Of these, there would be five or six dancers, no more than three (two Tumdaks and one Lagra) drummers and several village characters including two `comedians`, and the village chief. This was more than forty years ago. Realizing that he had a flair for carving human figures, from Banams, Som, who was about 18 then, started carving the tiny Chadar Badar puppets too. He admits that his work probably has more finesse because of the availability of better tools today. His Chadar Badni contraption is different from the others, Som says and is the result of his own creative engineering - where he simulates the movement of a `dheki` - a threshing tool - for the platform holding the dancing girls. The wheel on which the platforms revolve is also his own creation. Som was a master trainer at a 90 day training organized by cultural ethnographer, Ravikant Dwivedi about 5 years ago. 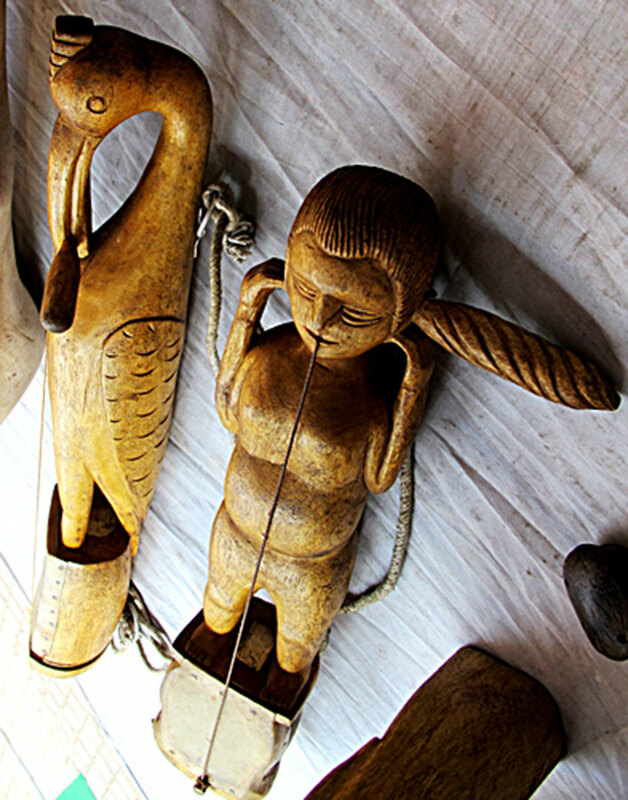 Som Murmu`s decorative banams cost about 7000 Indian rupees. There is a lot of thought that go into each of his carvings. For example, when there was a drought declared in Birbhum some years ago (2010), Som carved a pair of 3 feet banam statues of a naked couple as a response to the starvation and misery he saw around him. A true artist, everything he carves must answer a craving in his heart. Yet Som does not wish to dispense with tradition altogether and thus also displays traditional banams at fairs and the shops which display his instruments. He also makes the tiny two-stringed Kendri banam which is very melodious. As soon he gets free time after harvesting is over, he goes back to his banam making. Though he would use monitor lizard skin earlier for the membrane, he does not do so any longer. According to Som, for the bowstring, traditionally the fibres of the snake plant (Sansevieria) would be used and for the banam string, animal gut would be used. He remembers his father going to a meat shop, not to buy meat, but to procure goat`s intestines. He would then prepare the string by continuously scraping, cleaning and stretching the gut. However, these days, a twisted cotton string is used for the banam. Som`s father and his grandfather before him, would make only the traditional simple banam. Som has two daughters and four sons, none of whom have followed in their father`s footsteps, preferring to stay with cultivation. But he has a student, also called Som (from Kulukdanga village) who has learnt Chadar Badar and a little Banam making from him. Som feels that his student shows promise and that his finishing is good.